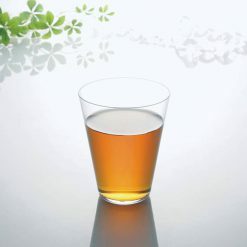 Sugarlady’s Tochuu Sangen cha (Eucommia ulmoides tea) is easy to drink, and is a healthy tea with added benefits of quercetin and contains no caffeine. Tochuu Cha works to improve slowed metabolism. Added quercetin which is has lots of benefits for those with high blood pressure. Bark of Tochuu (Eucommia ulmoides) is used as herbal medicine and said to help against body aches, fatigue, frequent urination, strengthen the functions of liver and kidney, as well as lower the high blood pressure. The tea made from the leaves are also known to lower blood pressure and improve the liver functions, which is due to the active ingredient called geniposidic acid. Geniposidic acid is known to work against the hardening of artiries and lower blood pressure by making veins and arties release nitric monoxide. Quercetin is a vitamin-like substance that works similar to vitamins, and is a type of flavonoid that has the yellow pigments within the polyphenol contained in fruits and vegetables. It promotes the blood circulation and therefore, it can help mitigate the symptoms of allergies, lower the blood sugar level as well as choresterol, and prevent hardening of arteries, high blood pressure. It also works as anti-aging, anti-allergen and anti-flammatory. Quercetin rich foods include onions, brocolli, snow peas, grapes, cranberries, apples, and wine among others. Simply open the bottle and enjoy. Can be served chilled or warm/hot. Making this a part of your lifestyle can help keeping your megabolism and weight at bay.As Tochuu Cha contains no caffeine, it can be servied to everyone including pregnant women and small children. Origin of ingredients: Eucommia ulmoides leaf (Japan) Prepared and packaged in Japan.